The best bit? You can ask for a squirt of ‘soy sauce’ which will be chocolate syrup! 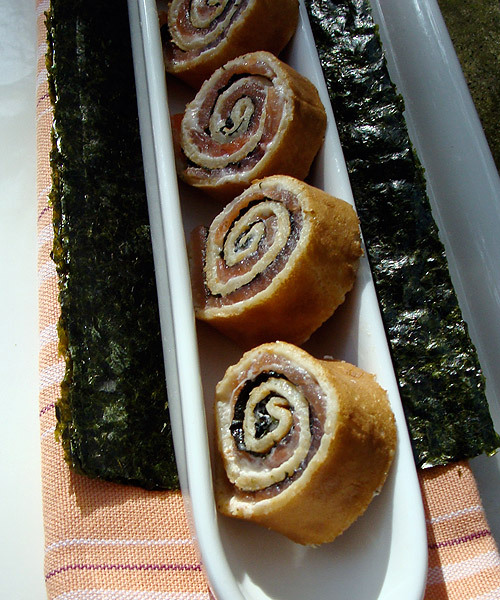 You might remember that I did a smoked salmon ‘sushi’ a while back which was a thin crepe filled with smoked salmon and nori, then rolled up and sliced to look like sushi. They were really yummy. Do you think the New Zealand Natural ice cream company saw my post and were inspired? Just kidding! I better go deflate my head. Have fun with this fellow-Aussies. I look forward to eating some when I’m back home in Sydney in December. I still get a little confused taste-wise when things look like they should be savoury and are sweet and vice-versa, so we’ll see how these go. They’re so cute! 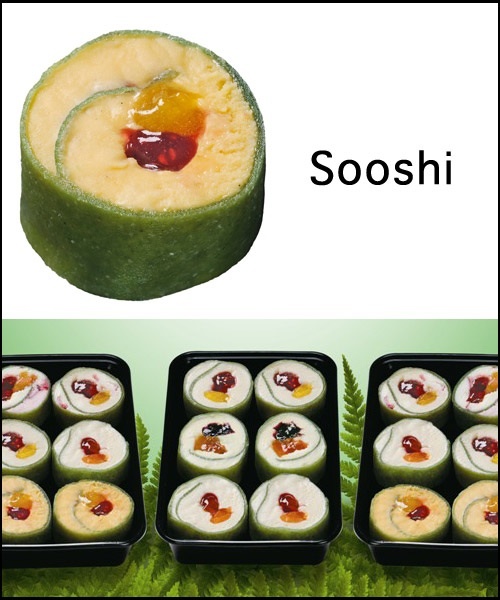 I wonder what the apple “nori” is made of. Mmm, I actually had an awful experience with these at the Melbourne NZN in Carlton. You can read about it here if you like, but I’m definitely sticking to actual sushi from now on! @Fiona – I see what you mean, let me know how you go! @Arwen – I think it’s liquorice? @Vee – Wow, some retail staff need a big hug, don’t they?